This portion of the railroad was opened in 1897 with the completion of the high bridge over the Allegheny River in Harmar (replaced 1918). Once the main line had been established many of the original structures were replaced in the twenty years which followed. In Harmar Twp and Indiana Twp (about 5.5 miles south of Dawson Rd), three other tunnels through embankments share similar design. Each are concrete shells with impressions of the plank formwork still showing in the ceiling vaults. The basic shape of the roof is a gable outer surface with an inner circular arch. The portal were then squared to retain the embankment. Stepped wing walls extend from the portals. In West Deer Twp at Dawson Rd, however, the portals are not squared; the gable remains visible. And the wing walls are merely short stubs. This tunnel provides passage for Dawson Rd through the 140 ft high embankment which carries the railroad. This tunnel is much longer than those to the south. The topography suggests there had been a yard in the area of Red Hot along Saxonburg Blvd; the Dawson Tunnel passes below. Some local residents refer to this site as the "Ghost Tunnel." They report sitting in their car in the middle of the tunnel for about 10 minutes then seeing a strange blue light at the portal. 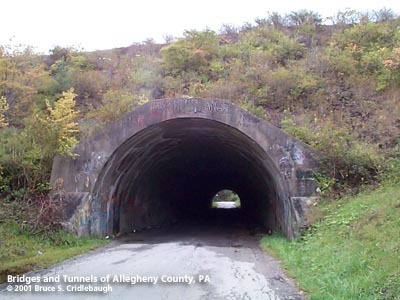 Within Allegheny County, there are two tunnels (North Bessemer and Bettis) associated with the Bessemer & Lake Erie line through which the trains pass, albeit both are on tracks owned by the Union Railroad. (The B&LE and URR were both part of the same company until 2001.) At Culmerville (About 1.5 miles south of Dawson Rd), Bakerstown Rd crosses the B&LE on a 1921 truss deck span; the site appears to be a daylighted tunnel. The embankment above Dawson Rd is approximately one mile long at a depth of about 140 feet above Rocky Run, a tributary of Bull Creek. Some of the fill appears to be slag and industrial by-products; some may have been from the cut at Culmerville. 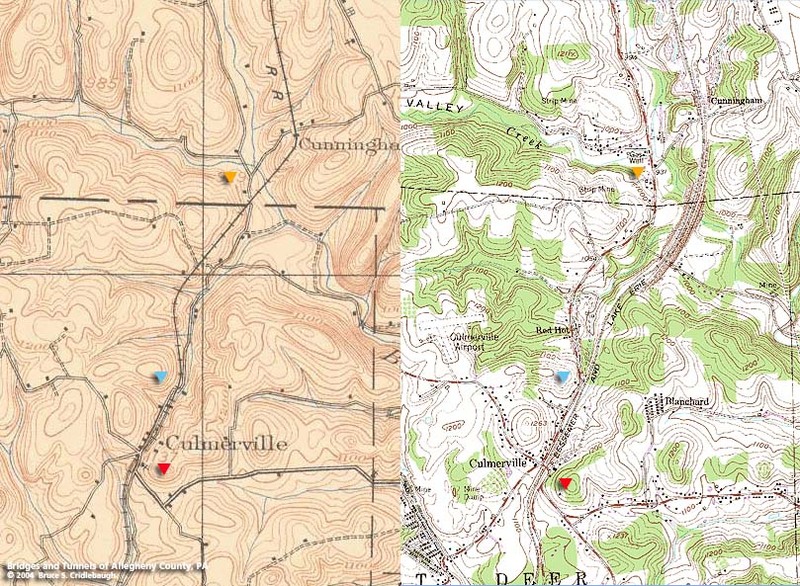 The 1906 USGS topo quad map New Kensington East shows the B&LE as double-tracked from a grade crossing about one-half mile of Culmerville. North of the crossing the railroad follows the present day route of Saxonburg Rd through Red Hot to a straight-line trestle approximately one-quarter mile long where Bull Creek crosses the Allegheny-Butler county line. Saxonburg Blvd in 1906 is shown following a creek -- a route which is now private driveways. At Culmerville, the road crosses the railroad at an unhindered angle which seems to indicate that it was not a grade crossing -- possibly a tunnel; and the long fill over present day Dawson Road had not been built. More evidence of an excavation or daylighting between 1906 and 1921.